This page is about Deux Sevres and the surrounding areas. Members are encouraged to send in details of local fairs, films, music, in fact anything that might be of interest. As you can see, Deux Sevres is about 5 or 6 hours driving from Cherbourg, 3 or 4 hours from St. Malo and 7 hours from Calais. The roads to Deux Sevres are generally very good and you can choose, south of the Loire, between the fast route the peage, or the scenic route. In consequence the Deux Sevres is a popular destination for retirement or for second/holiday homes for 'les Brits' and for other nationalities including the Dutch and Germans. There are a number of airports serving the region including Nantes, La Rochelle and Poitiers. 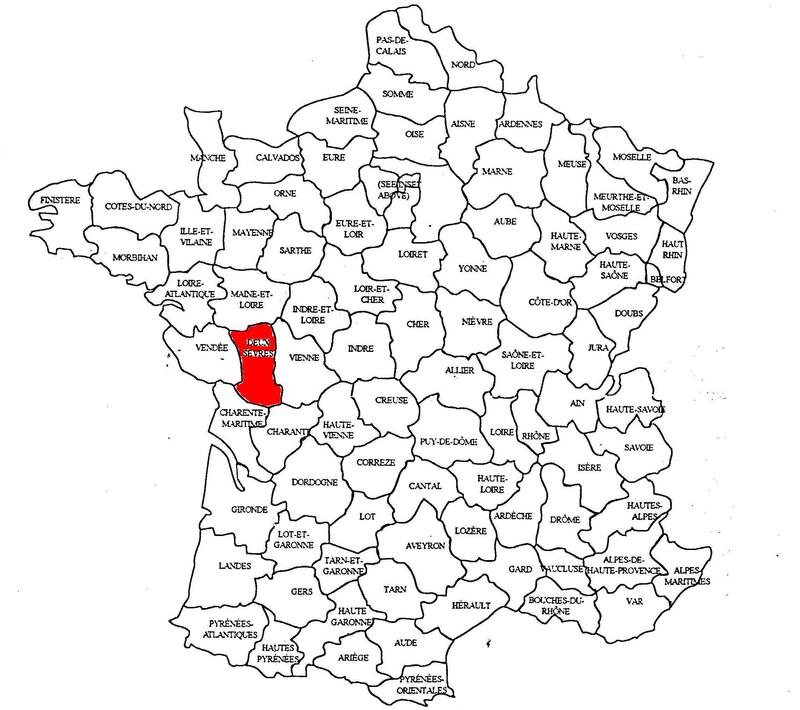 The main town of the department is Niort, where you will find many official buildings including the Prefecture, CPAM (health service) and the Bureau des Impots (tax office). Niort also offers good shopping either in the town centre with department stores and small boutiques or in the Mendes France shopping centre just off the road to Poitiers. An excellent market, Thursdays, can be found at the foot of the Donjon where the selection of fresh fruit, vegetables, meat, fish and cheese provides a wonderful choice of the best in the region. This town in the heart of the Gâtine is well worth a visit. Dating from the prehistoric, Parthenay sits on a rocky outcrop in a meander of the river Thouet and is important for its mediaeval connections. There are many historic sites including the rue de la Vau Sant-Jacques, principal artery of the mediaeval village. Parthenay also hosts many cultural and social events; one of the most popular is ‘Le festival des jeux’ which takes place in July when the whole of the centre of the town is transformed into an enormous open-air games exhibition where over 1,000 games, ranging from games of chance and logic, to traditional and multimedia, are available for the public to try out and play. Market day is Wednesday morning and there are plenty of traditional shops and restaurants in the town. Coulon, capital of the Venise-Verte, is a delightful town on the banks of La Sèvre Niortaise in the Marais Poitevin. From Coulon boats are available for hire, either with or without a guide, to tour the waterways of the Marais. At the heart of the French Atlantic coast, the marshland known as the Marais Poitevin lies in the area of a former sea gulf that has been developed by man over the past ten centuries. Here, the earth and the waters mix, forming landscapes that inspire poets and fascinate artists. This is a fabulous area, rich in unique natural sites and original traditions. We will update this page frequently so be sure to check regularly!